But what about the crowd you don’t know, who might donate – if they only knew you were there? Can we learn from research into social network habits and social networkers? 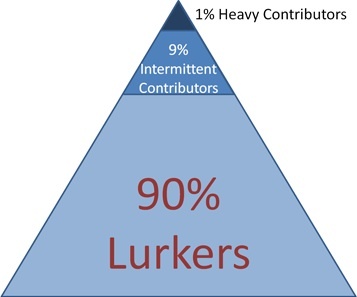 In most online communities 1% actively contribute, 9% do so intermittently and 90% are named “lurkers” – who read but do not engage or contribute. Crowdfunding can only reach a tipping point to be being part of our social, community and financial landscape if campaigns reach beyond their immediate social networks. The 1% active contributors also frequently access mobile social media which increases interaction; they generate, not just consume, content; they follow more organisations or companies and use less traditional media (TV, newspapers). (The social habit – frequent social networker) . Use of social media sites is growing in all age bands – the 2010 social network report shows that in 30 days 88% of 18-34 years olds visited a social network, with 69% of 35-49 years olds and 41% of 50+. What campaigns need to do: use as many social media platforms as possible for their campaigns – making it easy to access, support and donate; use blogs as news media; ask supporters to write for you; get “liked” by your supporters or get a link from sites popular to your social networkers. So your landing page or website might have many hits – but fewer donations – because 90% will be tourists or lurkers – with little interest and no social connections to your site. What campaigners need to do: link devotees (those with an interest in the subject) to minglers (the socialisers) to make your campaign something they want to connect with. Crowdfunding can create a relationship that makes them feel they are playing a valued and powerful role in making new ideas happen. 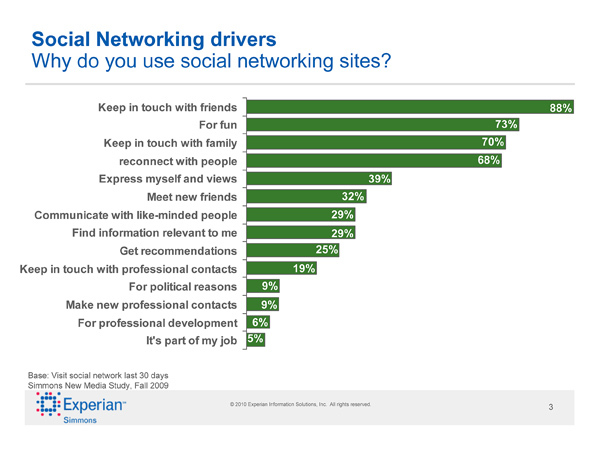 2010 social network report gives the main reasons (above) why people use social networking sites – that is to connect with people (friends, family and reconnecting). Fun is the second highest . Those that might seem more related to crowdfunding – political (or issue) interest, meeting like-minded people and gathering information are lower, much lower. Campaigners need to – ensure they reach people through their friends, family and wider social networks. Give permission for those with wide connections to post updates, make videos for you – as well as simple retweeting.